I love Warm Mulled Cider during the winter holiday season, but I’ll drink it from early fall when the apples come in and cider making starts all through the winter into the late cold Minnesota spring. It’s especially good if you are feeling a bit under the weather. Really, there’s not much better than Warm Mulled Cider when you’re sitting at home watching a movie (and don’t forget the Freshly Popped Popcorn) but when you really want to think about Warm Mulled Cider is just about anytime you want to a.) keep warm and/or b.) create good cheer and a sense of camaraderie. Toss your Warm Mulled Cider into a thermos (always prewarm your thermos with very hot water. Lid and let sit until you’re ready to pour in your cider) to keep warm to take along on an outing or a hike or make up a big batch and keep it warm in your slow cooker for a party or when you’re up Nord on a ski or snowmobile trip. Or maybe just make a big batch of it when the whole family is pitching in for chores. It’s great to keep spirits up while raking up the fall leaves or shoveling out after a blizzard. 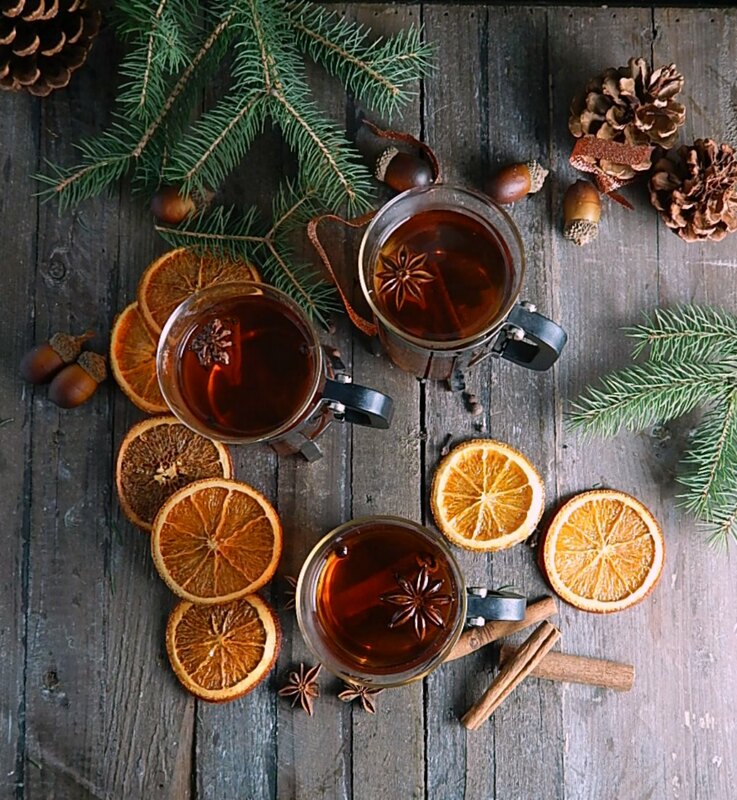 Warm Mulled Cider is just fragrant with the spices and citrus, and as good as it is, the only thing I can think of that’s better is to spike it with a bit of Apple Brandy (Calvados is always recommended, even if it’s a bit spendy) if you are so inclined. And if you’re not driving. Just like when you’re making Spiced Mulled Wine, you don’t really want to boil the Warm Mulled Cider mixture. Just a nice gentle heat will bring out the best from your Mulling Spices. A bit of time makes sure those spices permeate your apple cider. Once the Mulled Apple Cider is to your taste, or if you’re going to store any extra in the fridge, strain or scoop the spices out or they’ll get stronger and stronger. The spices in Warm Mulled Cider have developed over time to my favorite ones, feel free to adjust to what you like and/or have available. It’s all going to be good. I do love to use a really great, freshly presses cider, but that’s only available in the fall. And even the natural ciders are getting hard to find with the bottled juices. No worries, though, because this recipe will make any cider, even a plain old everyday cider from the fruit juice section, taste great. If you do decide to “spike” your Warm Mulled Cider, do it after the cider is heated through, then turn it off and add the hooch. Anything with alcohol shouldn’t be heated to over 173 degrees F., the temperature at which the alcohol will quickly dissipate. Just FYI, 212 degrees F. is the temperature of boiling, at sea level. Apple Cider prices will vary depending upon season and quality. Even when I’m on a budget, I do love a good, tart cloudy apple cider and look for it every fall (and of course, it’s always a fun outing to take a drive in the countryside and pick up some at an orchard) but I know that’s not for everyone! Watch for sales at the store, or maybe look for it at the farmer’s market if you go. Sometimes the farmer’s market prices are much lower than you’d expect. It just all depends. As you can see, there’s no real need to buy bags of prepackaged Cider mix. Making your own is just a few pennies. Watch for great prices on cinnamon at your hobby stores, of all places. Other places to buy spices at a great price are any Ethnic markets or in bulk at your store. Dried whole spices keep almost forever tightly jarred in a dark, cool cupboard. That means not above your stove or fridge which give off a pretty steady heat. Coming soon, I’ll be posting a page on making your own “mulling spices” in bulk; they’re great to have on hand and make a wonderful little hostess or Christmas gift. Teachers might appreciate a packet or two, just don’t give them another mug, lol! Although a packet or two of mulling spices might be appreciated along with one of those four or six packs of mason jar mugs in the darling little wooden boxes. Mix all ingredients but brandy and garnish in a large saucepan, bring to bare simmer, but do not boil. Simmer at least 30 minutes. Strain spices, if desired, and serve; the mixture may continue to concentrate in flavor if the spices are left in, so taste and decide. Brandy may be mixed in or simply passed on the side. Warm Mulled Cider may be made in a crockpot, but for speed, you may wish to bring to a simmer on the stove and then transfer to the crockpot to keep the cider warm for guests. Consider serving this cider with very little to no sugar in it, but passing little cubes of sugar for those who wish to adjust to taste. Note: dried orange slices work very well in this recipe, too, as well as fresh orange. This entry was posted in Click here for Fabulous Food Posts and tagged Alcohol, Apple, apple cider, Beverages, Slow Cooker. Bookmark the permalink. Love the smell of spices on the stove. Must try this one day. I realized that I just don’t make this often enough as soon as the spices started warming up and filling the house with their scent. You have a superb blog !! Thank you for sharing your beautiful space. Hi Andy, welcome! 🙂 And thank you so much! I’m glad to see you visit and hope you’ll stop by again! Ugh it’s snowing today. Which would make this drink perfect! Seeing as spring isn’t in any rush to arrive. Oh, no! You guys have been so hard hit! We had a little green here in MN, but then it dropped back to normal crappy March weather! Seems odd to post Cider in the Spring, but it was so perfect!! I remember reading those old British murder mysteries or historical romances and people having mulled wine or cider or something similar. Very Xmassy, I always thought with all those spices. I especially love your glass mugs. It’s chilly today here as well though no snow (finger’s crossed) so I wouldn’t mind a hot one of those mugs of yours when I get back from donating blood at the Red Cross and then a fast grocery shop on the way home. It seems a strange Spring recipe, but it is so warming! I know what you mean about reading and food/drinks mentioned! I always thought it would be fun to have a book club where everyone brings a recipe of the food from the book! Funny you mentioned the Red Cross because they gave me a reminder call last night. I had them put me on a “schedule” so I never have to think about it. So good for you! I wish more people would donate blood! I’d join THAT book club. Lovely spices! That must smell amazing! Thanks, Elaine! 🙂 It does make the whole house smell good!